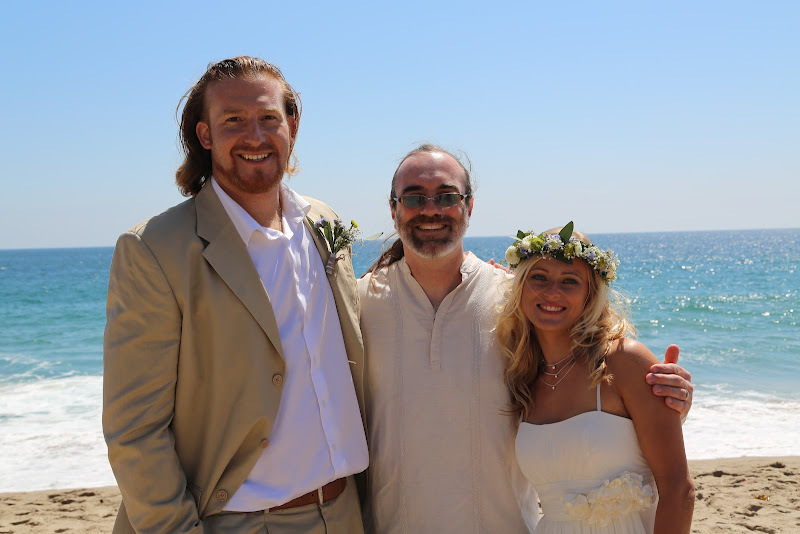 This entry was posted in wedding officiant and tagged dolphins, Malibu, Point Dume, wedding, wedding officiant. Bookmark the permalink. We always wanted to get married on the beach: bare feet in the sand, the sun, a fine breeze blowing and the ocean’s waves as a soundtrack… Dolphins were unexpected wedding guests like a gift from the nature to bless us and our friends on this magic day. Jon contributed a lot to this journey. Since our first meeting, he always provided a great support and inspiration in order to guide us through the ceremony: suggesting different texts, poems, blessings,as well as helping with all the administrative procedures. We appreciated his kindness, open minded spirit and easy going approach. It was just perfect on our wedding day: he became part of the family. Having Jon blessing us with his great smile made us happy and confident through the ceremony. Thank you so much Jon!!!!!!!!!!! !